"Frequently we are asked where the Fonds Suzan Daniel is housed, and if it is in one of the so-called ‘rainbow houses’. This question requires a complicated and rather time-consuming answer, and sometimes it’s a little bit difficult to explain." The Fonds Suzan Daniel is a non-profit archive and documentation centre in Belgium. 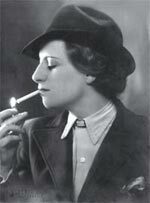 It was named after Suzan Daniel who in 1953 was the first person to start a gay/lesbian group in Belgium. As a neutral, independent and pluralist organization they have been cooperating with mainstream organizations. In his paper, Bart Hellinck reflects upon the challenges of the archive and points out the advantages and disadvantages of their partnerships. Do you also think it is important for an LGBTI archive to remain independent and stay out of umbrella organizations?What are your ideas about the challenges the organization faces, for instance, in regard to reflecting the diversity of the "LGBT-community"? In October 1995 three women and three men (aged 23 to 65), involved in the lesbigay movement and/or interested in lesbian and gay studies, came together for the first meeting of what would become the Fonds Suzan Daniel. We regretted the lack, within the movement, of awareness about and care for its archives. As a result a lot of important documents had already been lost, and many others were in danger of meeting with the same fate. But from the beginning raising the awareness wasn’t enough for the six initiators: organizations needed to be told how best to take care of their archives, and – more important – eventually something should be done with this material, including professional storage and arranging its accessibility. Since the movement had (and has) many other things to do, and thus didn’t have the time (nor the expertise or the means) for long-term archives administration, the six initiators quickly concluded that another solution had to be found. Our little group of six consisted of three historians (one being a PhD, while another would subsequently start his training as an archivist), two philosophers and one librarian. All of us were either professionally linked with centres of cultural heritage or were familiar with these institutions as researchers. We were therefore reasonably well aware of the complexity of running an archives and documentation centre. We were not naïve, were not seized by the whim to do something in a hurry, but took the time to look for a long-term formula. This led to the official founding of the Fonds Suzan Daniel in May 1996, and its presentation to the public in December of that year. In 1995-1996 the situation was simple: we had no money, and consequently no staff nor accommodation of our own. More than 15 years later we still run on a very tight budget, we still don’t own or rent any premises, and we still depend entirely on a limited number of volunteers. But we really don’t consider this a major problem: our main focus is to manage our collection that in the meantime takes up more than 400 running metres of shelves. This has always been the principal objective of the six founders: saving as much as possible of the LGBTQ heritage, and making sure that is it kept in reliable conditions. Another important element of our musing back during our first meetings: ensuring the continuation of our project, because the LGBTQ archives were (and are) too important for them to depend solely upon the mood or the possibly short-term commitment of a couple of persons. Although ‘amateurs’ with no money, it was our firm conviction that the Fonds Suzan Daniel should work as professional as possible. And it was clear for us right from the start that we couldn’t guarantee this on our own. So we got in touch with a couple of professional (private) archival institutions, which resulted in a partnership agreement. And in a win-win situation for everyone involved: our partners were interested in the LGBTQ archives but lacked connections in this field, while we found some repositories (with the required archival storage conditions, with acid-free archives boxes etc.) to store our future collection. And this for free! Besides it allows us to benefit from our partners’ expertise. The partnership agreement is however only a framework. Every single transfer of an entity of records and/or documentation to one of our partners is being regulated by a contract. This material is then being stored in the depots of one of our partners – chosen on the basis of some criteria – and can be consulted in its reading room during working hours. But we are (very deliberately) actively involved in this process: the Fonds Suzan Daniel remains the owner (or at least manager) of its collection and we manage it very closely. Our volunteers for instance make most of the inventories of archival records and catalogue the books, magazines, gadgets… And in case the creator of the archives doesn’t have specific (and more strict) requirements, it is the Fonds Suzan Daniel that has the final say with regard to privacy protection, i.e. in the matter of which documents can or can’t be consulted for a specific aim (research, exhibition…). This formula however is not without some disadvantages. The first being the fragmentation of our collection: it is not stored in one single place, but (at present) parts can be found in Louvain, Brussels and (two institutions in) Ghent (1). In fact the six initiators of the Fonds Suzan Daniel certainly didn’t prefer this fragmentation, but it resulted automatically from the choices that were being made by our partners. Anyway, working together with a couple of institutions – all with their own specialty – enables us in the meantime to anticipate the record creators’ preferences. The disadvantage that we have to cope with the most, is the absence – for an outsider – of a (as such identifiable) building of our own. Frequently we are asked where the Fonds Suzan Daniel is housed, and if it is in one of the so-called ‘rainbow houses’. This question requires a complicated and rather time-consuming answer, and sometimes it’s a little bit difficult to explain. But we remain convinced that the many advantages outweigh these disadvantages. Without this formula we wouldn’t have been able to achieve what we now have. A lot of archival institutions with own housing seem to be confined to their premises and hardly ever break out of it (trying) to reach the public in another city or region. With respect to this the Fonds Suzan Daniel has a bit more freedom (although our limited budget doesn’t allow us to do all that we would like to do.) Furthermore our partnership enables us to focus upon the essence (the LGBTQ cultural heritage), instead of busying ourselves a considerable part of the time with making that possible (fundraising for accommodation, lobbying for subsidies, etc.). And by the way, since the Fonds Suzan Daniel is the owner (or in some cases the manager) of its collection, there always is the option – when one day we would have enough money and some long-term guarantees, and if we would consider it beneficial – that we go our own way. But that will not be the case in the foreseeable future. On the contrary, the choice that we have made, has been copied by others. Shortly after the foundation of the Fonds Suzan Daniel we were invited by the organization of professional archivists and librarians in Flanders to explain our pioneering scheme, which was considered an interesting novelty. Since then similar initiatives have been set up regarding, for example, musical and architectural archives. a little group of motivated volunteers (with no budget), some of whom were working in the field of cultural heritage; with the Fonds Suzan Daniel that is able to create a distinct profile; that is present at for instance Pride events and has become a familiar presence there; that manages its collection very closely; that operates as a trustworthy intermediary between the record creators, researchers… on the one hand and the professional archives where its collection is being kept at the other. That very first meeting in October 1995 was not only important because of the partnership idea. At the same time a couple of other important decisions were made concerning the future position of our initiative. Firstly we certainly didn’t want to limit us to the LGBTQ movement, but are potentially interested in every material (that is somehow relevant to the Belgian situation) with regard to homosexuality, lesbianism, bisexuality, transgender, AIDS/HIV. Secondly we want to remain independent, neutral and pluralistic. In the past there have been a lot of disputes and even rifts within the movement (radicals vs. moderates, men vs. women, etc. ), while the relationship between the movement and the commercial venues hasn’t always been very good. Furthermore a lot of individual lesbians, gay men etc. don’t (want to) have anything to do with the movement. As an archives that wants to save as much as possible of our heritage, the Fonds Suzan Daniel wants to be as acceptable as possible to as many archive creators as possible. That means that we, as an organization, will never express any opinion. And that we will never join a Belgian LGBTQ umbrella organization. (Because if we would become a member of one such umbrella organization, we would have to join every such initiative, now and in the future.) But this doesn’t exclude us from trying to establish the best of relations with any group. At the same time our responsibility regarding privacy protection was stressed. And Suzan Daniel (= the pseudonym of the woman who in 1953 founded the first Belgian lesbigay emancipation group, but had been totally forgotten afterwards) was already suggested as a suitable name for our initiative. A couple of months later, while preparing the official foundation of the Fonds Suzan Daniel, it was decided in the articles of association that our executive board should always have an equal number of male and female numbers. Since the Fonds Suzan Daniel runs on a very tight budget, we’re not able to buy books, magazines etc. but have to rely upon donations. (A couple of interesting personal libraries have been promised to us, but normally we won’t be receiving them very soon. In any case we wish everyone a long, healthy and prosperous life.) This automatically means that we usually can’t offer the most current information. We have learned to live with this deficiency as well, although it would be a lot more pleasant now and then to possess recent (non-fiction) publications. On the other hand there are other institutions (the LGBTQ movement, university libraries etc. as well as IHLIA that is very easily accessible from Belgium) that all can play their part. Any advice on this (and many other topics) will of course be enthusiastically welcomed! Approximatively 80% of our collection is none the less stored at one of our partner institutions.